If you’re anything like me, when you think middle-grade voice, the cover of A CROOKED KIND OF PERFECT materializes in your mind’s eye. I think of that book as the pitch-perfect example of middle-grade voice. I couldn’t wait to read Linda Urban’s latest, HOUND DOG TRUE. That’s a literal statement. I sent a somewhat pitiful I-really-don’t-think-I-can-wait request (our publishing houses are closely related) and was delighted to receive an ARC. And man alive, she’s done it again. Today’s post is an interview with the wonderful Linda Urban. Read every word. It’s truly delicious. If, at the outset of A CROOKED KIND OF PERFECT, Zoe was asked to describe a perfect friend for herself, I’m guessing she wouldn’t have described Wheeler. The same can be said about Mattie and Quincy. Do you know, when you set out to write a book, that your main character is going to find an unlikely friend? I know almost nothing when I start writing. Usually I start with a voice, which tells me about the character – her outlook on the world, her main concerns, her immediate circumstances. I write and people and situations show up on the page. 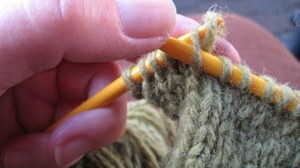 It’s a little like knitting. One loop connects to the next connects to the next, each dependent on the other for its form. Around page 30-40 I look up from my knitting. Holy cats. What is this supposed to be? What am I going to turn it into? Is this a scarf? Or a sleeve? I do like stories where interaction with someone who seems so different from the main character provides her with a new way of seeing herself – and also brings her outside of herself to see others for who they really are. I find this happens in just about everything I write. I wonder why that is? You set the bar pretty high on middle-grade voice with both of your novels. Is that something that’s right there, waiting, when you sit down to write, or is it something you work hard to cultivate through writing and revision? Golly. Thanks for saying that. Voice is pretty essential to my writing process. It’s the key ingredient to starting any project for me. I’d love to be a writer who could think of a plot or a high-concept situation and then create characters to fit. That seems so smart and rational and professional. But for me it is voice. A first line, then I’m off. And then Mattie went up to Quincy. And then Quincy said “Hello” and Mattie felt scared. I hate revising those sentences to fit with the voice. I’d rather revise a bad chunk of story in the proper voice than a good set of actions/plot development/etc. in the wrong voice. The latter feels unwieldy and nearly impossible – like putting a tantruming three year old in a snow suit. It can be done. It must be done. But it is no fun for anyone involved. What were your favorite books as a young reader? Favorite characters? I loved all the Little House books and the Ramona books. I was a kid during the nation’s bicentennial, so there was a very patriotic reading stint where I read a lot of biographies of founding fathers and other important Americans. If you could have chosen a fictional character from one of those books to move next door to younger-you, whom would you have picked and why? I wouldn’t have wanted Laura Ingalls to move next door to me, because that would mean she would live in Lori Collins’s house and she would have a boring suburban life like I did. I wanted to move next door to Laura – in time and place. That I would have loved. We’d have sung along with Pa as he played the fiddle, and I’d have churned butter and worked on a nine-patch-quilt. I think I liked that even though Laura was little, she had a lot of courage and responsibility. I didn’t feel like Laura was waiting for things to happen, like I was when I was young. I was waiting for someone to see me and tell me I was responsible and smart and special and worth being the subject of a novel. Of course, these are things that we can’t wait for can we? We have to tell ourselves those things, and then become them. Which is sort of what the kids in my books do. My characters are much smarter than I ever was. What can you tell us about Ruby, the main character in the novel you’re writing now? I really love Ruby. She’s one of those capable girls who people count on to do exactly what they are supposed to. She doesn’t stand out in any way, and that has been okay with her. There’s been a comfort in that. Until now, of course. Now something has gone the opposite of the way Ruby thinks it should have – because she did not do what she thinks she was really supposed to have done. She might have a chance to fix it – just one chance – if only she can figure out how . . .
Well, that was sort of confusing, wasn’t it? I always have this trouble describing my books and my characters. If I could reduce them down to a line or two, I wouldn’t need to write them out as novels, I guess. In fact, most of the time the books that I set aside and don’t finish are ones that can easily be reduced. Either they’re too simple to carry the weight of a whole book, or I’m too bored to finish them. Linda, thank you so much for stopping by. See? Delicious, right? You can learn more about Linda by visiting her website. And keep your eye out for HOUND DOG TRUE; its release date is September 20. This entry was posted in Uncategorized and tagged A Crooked Kind of Perfect, Harcourt, Hound Dog True, Laura Ingalls Wilder, Linda Urban, Little House, middle-grade fiction, Ramona, voice. Bookmark the permalink. 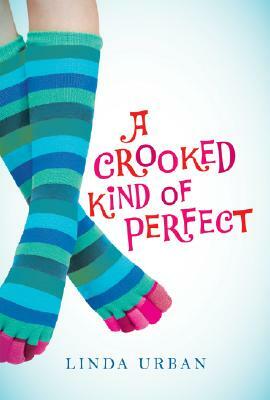 I loved a Crooked Kind of Perfect and I can see how Linda starts with voice. “I hate revising those sentences to fit with the voice. I’d rather revise a bad chunk of story in the proper voice than a good set of actions/plot development/etc. in the wrong voice.” Ding, ding,ding. That’s what I’m struggling with now. Light bulb moment! Thanks for sharing her process and can’t wait to read Hound Dog True. Congrats on your new book, Linda. I loved the voice in Crooked Kind of Perfect. Great interview, you guys!